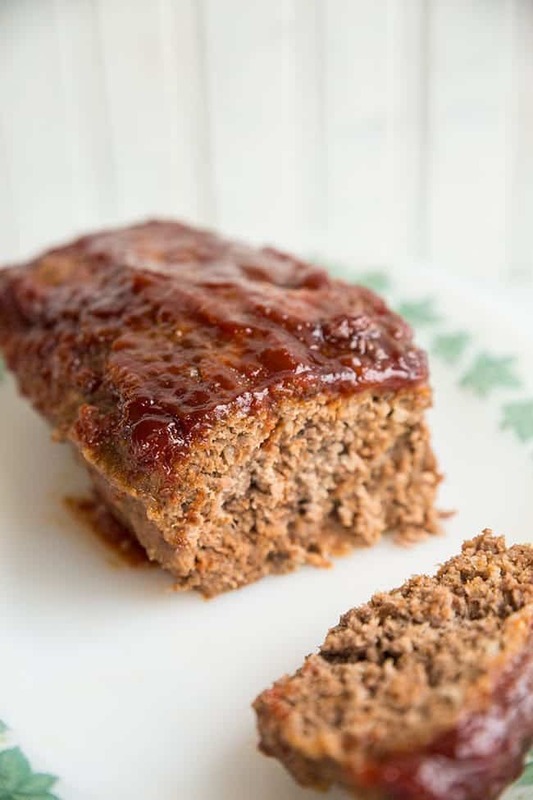 This retro meatloaf has an awesome ketchup based sweet and sour sauce on top. 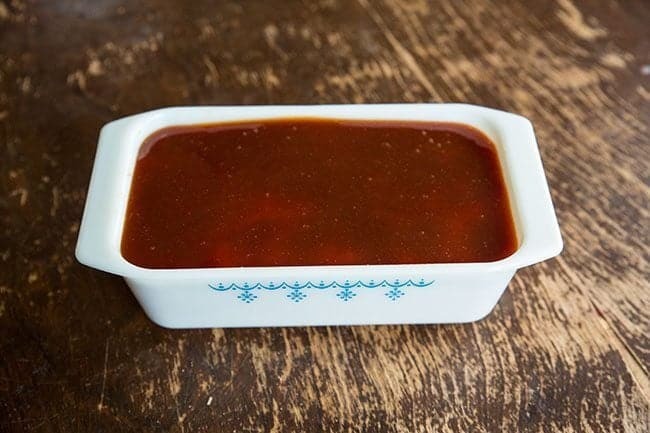 You know then one, it has tangy mustard, brown sugar, white sugar and basically was the topping for every meatloaf that our Mom’s made in the 1970’s/1980’s. It’s the mustard that does it. It adds that little tasty touch to the sauce that just says “Moms meatloaf”. Let’s start with first things first. 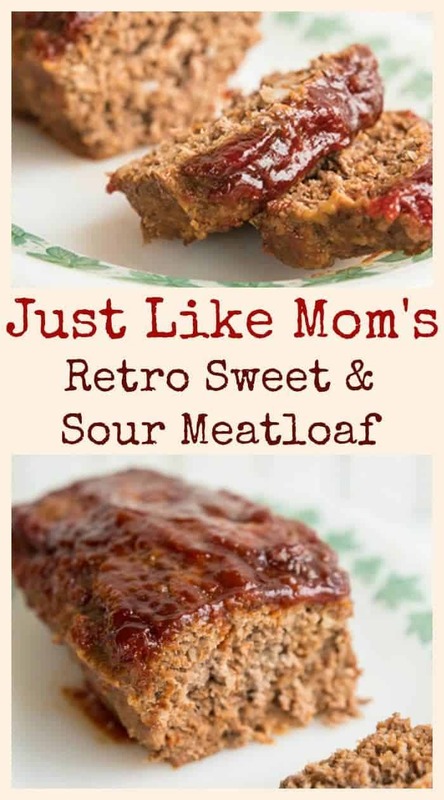 I was craving an awesome, retro-licious sweet and sour meatloaf. In August. You can TOTALLY eat sweet and sour meatloaf in the summer. Winter doesn’t get to have all the good food. Season’s aren’t the boss of me. I’ll eat in, around, over, out of, and under season if I darn well want to. Because you know what? Edmonton is cold somedays, even in the summer. Today we are under a heavy rainfall warning here in parts of Alberta, and let me tell you, it’s cold and POURING RAIN. Bah. We get so little summer as it is here in Alberta, and this week looks like it’s going to be absolutely crummy. Here’s hoping that fall treats us a little better than the past week has. Because I also ordered 8 new trees that we have to plant in the backyard before we head out on a trip soon. That’s my style. Oh, you’re heading out on a trip Karlynn and you have to pack, clean the house and make all sorts of plans? I think you should order some new trees to plant in the backyard as well. Who needs sanity? Not me. Sanity is totally overrated. And dry weather to plant your new trees in? That’s completely overrated as well, right? Sigh. Season’s may not be the boss of me, but the crazy Alberta weather sure is. Here’s hoping that it clears up for a couple of days so that I can get those dang trees planted. This is the view out of my bonus room window today. 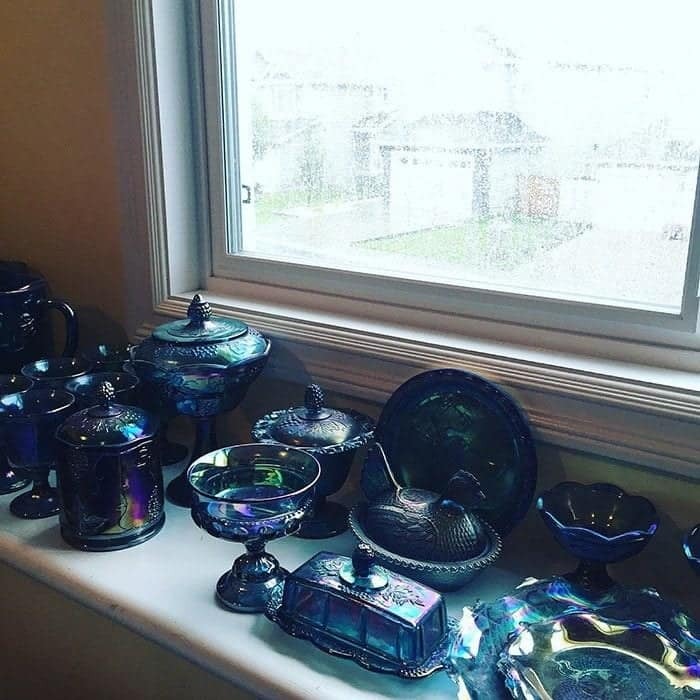 Crazy rain and my beautiful blue carnival glass to cheer me up. Let’s get back to talking about retro meatloaf. I wanted a meatloaf that had that awesome ketchup based sweet and sour sauce on top. 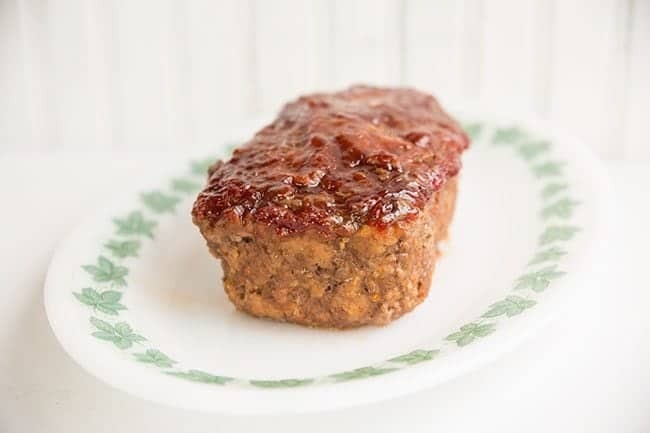 You know then one, it has tangy mustard, brown sugar, white sugar and basically was the topping for every meatloaf that our Mom’s made in the 1970’s/1980’s. It’s the mustard that does it. It adds that little tasty touch to the sauce that just says “Moms meatloaf”. Unlike most recipes, I whisk my ingredients together and pour it on top and THEN bake the meatloaf. Why on earth would I want to cook something on the stove, in another pot, halfway through the meatloaf cook time and then pour it on top to cook? Save a pot. Bake it all at once. On another note, how can summer be almost over? How can it be time to get into meatloaf and pumpkin and everything Autumn? How can it be time for my kids to NOT go back to school? Remind me again why we are homeschooling this year for a second time as I listen to my children fight while cleaning their rooms. How many more days until the 2017-2018 school year when I send them back? 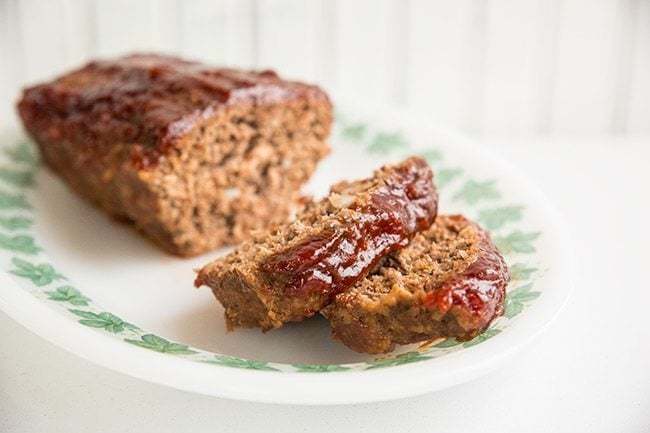 Fabulous retro meatloaf with a sweet and sour sauce on top! Reminds me of the 1970's SO much! Combine the beef, onion, bread crumbs, ketchup, salt, pepper and eggs; mix well. Press into a 9x5 loaf pan. Pour over meat loaf; bake 60 minutes or until a meat thermometer inserted into the middle reads 165°. Wondering what temperature to cook it at? Nice retro trick with the cornflakes!! Hope you like it! Oh, *I* remember my mama making this! Yes, I must do it. VERY good. Like the meatballs, but a more tomato-y sauce on them. One of my favorite meatloafs!